as above, Bank of England, plan labelled: Chamber, Eating Room, Study, (cancelled) Mr Billings (twice), (cancelled) Kitchen, Bed Room (twice), Closet, Dressing Room, Mr Banks (three times), and plan labelled (pencil): Mr Bruce (twice), Mr Rippen's / Kitchen, Mr Rippen, and dimensions given for all the rooms in the blue portions of both plans. 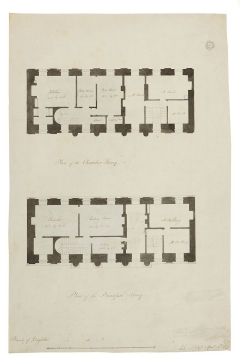 Drawing 8 shows the front entrance building as altered by Soane in 1789. Soane provided a third residential apartment, to house one of the Parlour Door Keepers. It also appears that more offices were included. The drawing was copied in 1797. The plans could have been used at that date for a survey of temporary office spaces. During construction of the north-east extension, room had to be found for those displaced by the building works.